What is commonly known as creeping thyme refers to one of several woody-stemmed perennial species of the Thymus genus that are good ground covers for sunny areas. While not all types are specifically grown as herbs, they do have a pleasant scent and most can be used for culinary purposes. The thymus genus is a large group, all of which are perennial plants in moderate climates. While some are upright plants with a shrub-like growth habit, the creeping types described here are low, with a vine-like growth habit. Related to the edible herbs, creeping thymes are also aromatic. They are principally grown for the fine texture of the leaves as they spread out to softly blanket the ground, but they also produce flowers of various colors, depending on type. The flowers usually appear late spring and early summer. Spicy orange thyme, creeping lemon thyme and caraway thyme all bear pink blooms and stay short (4 inches or less). Red creeping thyme and white creeping thyme attain a height similar to these. Wooly thyme may reach 6 inches in height, but do not worry: it does not spread quickly. ...the fine flavour of the honey of Mount Hymettus near Athens was said to be due to the Wild Thyme with which it was covered (probably T. vulgaris), the honey from this spot being of such especial flavour and sweetness that in the minds and writings of the Ancients, sweetness and Thyme were indissolubly united. 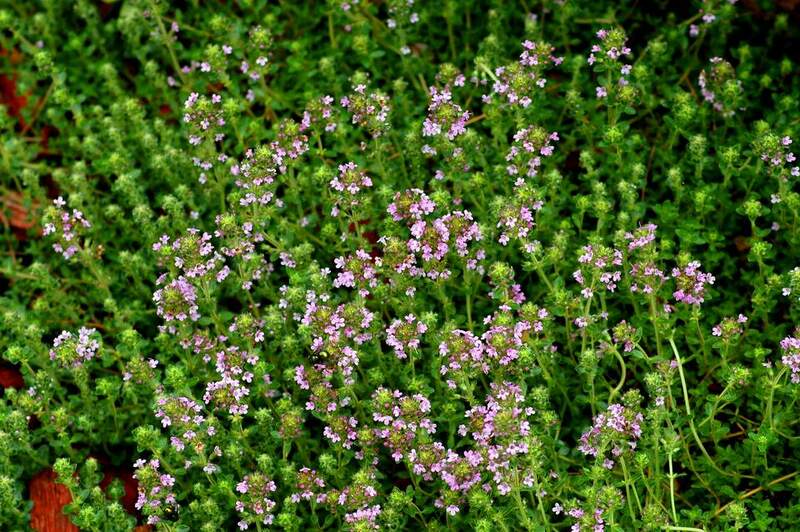 English thyme (Thymus vulgaris) is the best-known variety; it is also known as common thyme or garden thyme. This is the form that is often grown as a culinary herb. Creeping thyme plants generally stay short and can be effective ground covers. Some people go as far as using them as grass alternatives. A more common use for them is as a ground cover to fill in the spaces between stepping stones, although caraway thyme may be too aggressive for this purpose. Wooly thyme, which has silvery foliage, may be a better choice in tight areas. This slow grower will not engulf your stones so quickly in a mass of foliage. White and red thymes, planted en masse, provide a fine floral display. Wooly thyme meanwhile is grown for its soft, silvery foliage. [T]hose which perfume the air most delightfully, not passed by as the rest, but being trodden upon and crushed, are three; that is, burnet, wild-thyme, and watermints. Therefore you are to set whole alleys of them, to have the pleasure when you walk or tread. As an herb, thyme is used to flavor not only meats but also soups and stews, olives and olive oil, breads, and desserts. If you will be growing thyme for culinary purposes, note that you can use it either fresh or dried. If you are going to dry thyme leaves, wait till after the plant has bloomed, then harvest the fresh growth. Harvest in the early morning, after the dew has evaporated. Bundle up a few sprigs and hang them out of direct light in a dry place indoors (for example, in an attic). When completely dry thyme can be stored in an air-tight container. Herbalists have long known of thyme's medicinal qualities, using it as an antiseptic. Listerine contains a compound called, "Thymol," which is derived from thyme. Spicy orange thyme, creeping lemon thyme and Caraway thyme are best grown in USDA hardinss zones 5 to 9. Red thyme and white thyme are suitable for zones 4 to 9. Wooly thyme is listed for zones 6 to 8. These herb plants grow best in a soil with an alkaline pH. It is a must that the soil be well-drained, too. And far from craving fertilizer, creeping thyme seems to crave poor soils, as do most herb plants. Grow them in full sun if possible, although they will tolerate a bit of shade. Creeping thyme plants can become woody over time. If woody stems begin to dominate, you may want to remove and replace the plants. Strongly pruning back the plants may rejuvenate growth. There are very few problems to anticipate with creeping thyme, although they can be susceptible to root rot in soil that is too moist.